The e-POP Imaging and Rapid-scanning ion Mass spectrometer (IRM) measures the composition and 3-dimensional velocity distributions of ions in the 0.1-100 eV/q and 1-40 amu/q range. From these measurements scientists can determine the bulk plasma parameters in the ionosphere such as ion density, drift velocity, and temperature, with the goal of exploring topics including ion outflow from the topside ionosphere, perpendicular ion heating and acceleration, storm-time molecular ion upflow, and others. 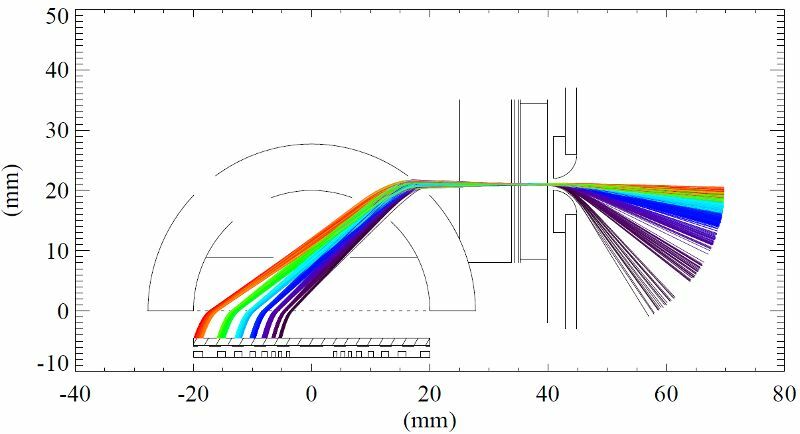 IRM is a “3-dimensional” and improved version of the Nozomi Thermal Plasma Analyzer (TPA) instrument and its predecessors. The IRM sensor is cylindrical and is deployed on an 88-cm boom. Its entrance aperture has a 360° Field of View (FOV) perpendicular to the deployment axis and close to 120° FOV along the deployment axis. The IRM sensor employs a hemispherical electrostatic analyzer, a time-of-flight gate, a toroidal deflector, a micro-channel plate detector, and a position-sensitive anode (see figure below). 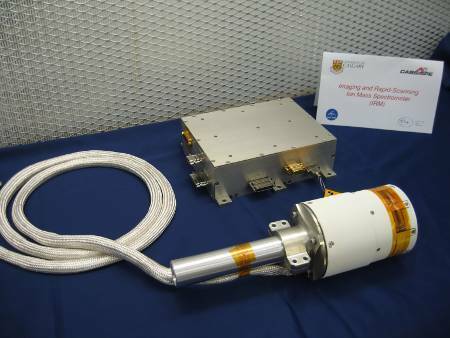 The operation of the IRM sensor is controlled by an electronics module inside the spacecraft that sets the measurement parameters including timing, voltages, pixel binning, etc. IRM has several operating modes, allowing it to optimize the energy, mass, angular, and/or temporal/spatial resolution of the measurements. IRM was developed, built, and tested at the University of Calgary under the direction of Drs. Peter Amerl and Andrew W. Yau. A side cut-away view showing simulated trajectories of ions entering the IRM sensor. Outside the sensor the low-energy particles (darker colors in the figure) are deflected from larger elevation angles into the detector by the outer electrode ring, giving IRM its 3-D imaging capability. Ions pass through a time-of-flight gate (the timing information allows a determination of the ion mass) and enter the hemispherical domes where they are again deflected by an electric field and separated based on energy – the ions with lower energy are deflected towards the inner part of the bottom plate and land on pixels closer to the center of the instrument. By knowing the voltages on the plates, the time it took for the ion to reach a pixel, and which pixel the ion landed on, scientists can determine the mass, energy, and direction of arrival for each ion.